^ Doerr, Thomas (2012). Passive Solar Simplified (1st ed.). Retrieved October 24, 2012. ^ Norton, Brian (2014). Harnessing Solar Heat. Springer. ISBN 978-94-007-7275-5. ^ "U.S. Department of Energy – Energy Efficiency and Renewable Energy – Energy Plus Energy Simulation Software". Retrieved 2011-03-27. ^ a b "Rating tools". Archived from the original on September 30, 2007. Retrieved 2011-11-03. ^ a b c Talamon, Attila (7 Aug 2013). "Passive Solar Design in Architecture – New Trend?". Governee. ^ a b "Your Home Technical Manual - 4.3 Orientation - Part 1". archive.org. 9 November 2012. ^ a b "Your Home Technical Manual - 4.7 Insulation". archive.org. 25 March 2012. ^ "BERC – Airtightness". Ornl.gov. 2004-05-26. Retrieved 2010-03-16. ^ "Your Home Technical Manual - 4.6 Passive Cooling". archive.org. 20 March 2012. ^ "EERE Radiant Barriers". Eere.energy.gov. 2009-05-28. Retrieved 2010-03-16. ^ a b c d "Glazing". Archived from the original on December 15, 2007. Retrieved 2011-11-03. ^ Springer, John L. (December 1954). "The 'Big Piece' Way to Build". Popular Science. 165 (6): 157. 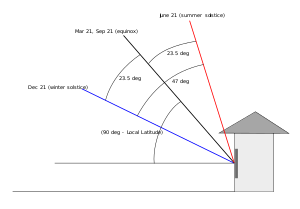 ^ "Your Home Technical Manual - 4.4 Shading - Part 1". archive.org. 21 January 2012. ^ "Your Home Technical Manual - 4.9 Thermal Mass". archive.org. 16 February 2011. ^ "Introductory Passive Solar Energy Technology Overview". U.S. DOE – ORNL Passive Solar Workshop. Retrieved 2007-12-23. 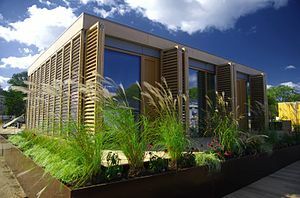 ^ "Darmstadt University of Technology solar decathlon home design". Darmstadt University of Technology. Archived from the original on October 18, 2007. Retrieved 2008-04-25. ^ "Passive Solar Design". New Mexico Solar Association. Archived from the original on 2015-12-01. Retrieved 2015-11-11. ^ a b c d e f g h i Wujek, Joseph (2010). Mechanical and Electrical Systems in Architecture, Engineering and Construction. Pearson Education/Prentice Hall. ISBN 9780135000045. ^ Sharifi, Ayyoob; Yamagata, Yoshiki (December 2015). "Roof ponds as passive heating and cooling systems: A systematic review". Applied Energy. 160: 336–357. doi:10.1016/j.apenergy.2015.09.061. ^ Shurcliff, William A. (1980). Thermal Shutters & Shades – Over 100 Schemes for Reducing Heat Loss through Windows 1980. ISBN 978-0-931790-14-0. ^ "Florida Solar Energy Center – Skylights". Retrieved 2011-03-29. ^ "U.S. Department of Energy – Energy Efficiency and Renewable Energy – Sunspace Orientation and Glazing Angles". Retrieved 2011-03-28. ^ "Solar Heat Gain Through Glass". Irc.nrc-cnrc.gc.ca. 2010-03-08. Archived from the original on 2009-03-21. Retrieved 2010-03-16. ^ Chiras, D. The Solar House: Passive Heating and Cooling. Chelsea Green Publishing Company; 2002. ^ "[ARCHIVED CONTENT] Insulating and heating your home efficiently : Directgov – Environment and greener living". Direct.gov.uk. Retrieved 2010-03-16. ^ "Reduce Your Heating Bills This Winter – Overlooked Sources of Heat Loss in the Home". Allwoodwork.com. 2003-02-14. Archived from the original on 2010-09-17. Retrieved 2010-03-16. ^ Andrade, Martin (6 March 2011). "Solar Energy Home Design" (PDF). ^ "Industrial Technologies Program: Industrial Distributed Energy". Eere.energy.gov. Retrieved 2010-03-16. ^ "Cold-Climate Case Study for Affordable Zero Energy Homes: Preprint" (PDF). Retrieved 2010-03-16. ^ "Zero Energy Homes: A Brief Primer" (PDF). Archived from the original (PDF) on 2006-08-13. Retrieved 2010-03-16. ^ Lotfabadi, Pooya (2015). "Solar considerations in high-rise buildings". Energy and Buildings. 89: 183–195. doi:10.1016/j.enbuild.2014.12.044. ^ Wong, Irene; Baldwin, Andrew N. (2016-02-15). "Investigating the potential of applying vertical green walls to high-rise residential buildings for energy-saving in sub-tropical region". Building and Environment. 97: 34–39. doi:10.1016/j.buildenv.2015.11.028. ^ Raji, Babak; Tenpierik, Martin J.; van den Dobbelsteen, Andy (2016). "An assessment of energy-saving solutions for the envelope design of high-rise buildings in temperate climates: A case study in the Netherlands". Energy and Buildings. 124: 210–221. doi:10.1016/j.enbuild.2015.10.049.